All 72 counties in Wisconsin are officially in a state of emergency. The National Guard is helping people off the highways. A blizzard warning is in effect until midnight tomorrow. We’re getting over a foot of the white stuff. 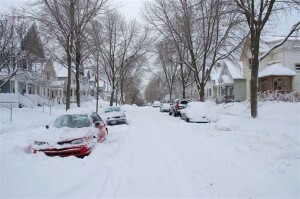 Gusting winds, up to 50 MPH, are expected to cause some crazy-dangerous snowdrifts. The governor has asked people not to leave their homes. In a few months I’ll doubtless be stir-crazy, pale, and sick of winter, but tonight⎯toasty and safe, with a mug of hot chocolate, twinkling Christmas lights, and the promise of a snow day wrapped around me like a blanket⎯life is really, really good. So it’s a little early for a year-end playlist, but here are some of my favorite tunes from 2009. What are yours? rachel, this list is awesome! can’t wait to play it, downloading now. and oh! 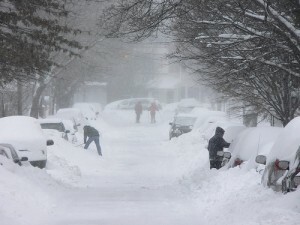 the snowstorm, the hot chocolate, the government mandate to stay inside your house! I have a well-known deficit of “fun” music in my collection that I am always so happy to remedy with Rachel’s mixes. Will tonight turn into an impromptu dance party? Perhaps. I’m so excited about your playlist, Rachel! I’m just about to go have some tea at a nearby spot, and you’ve inspired me to bring my headphones along. I’m also a bit jealous of your inclement weather. It’s been down in the high 30’s the past couple of nights and we’re freezing our bums off, but of course we Californians have silly things like leaky french windows, only 1 heater (livingroom) and no insulation. 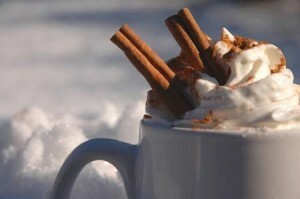 I long for snow, hot chocolate, fireplace, and enforced homebody-ism. Enjoy your snow day! Thanks to all! It’s been a pretty great day (except for one of the cats knocking over the Christmas tree). Orange pekoe, Robert Wyatt, and a giant Neal Stephenson novel I’ve been wanting to tackle for a while. Good snowy day stuff. We might even get two days at home out of this storm (!). Can’t wait to hear what others have been listening to in 2009. (Hint.) Will there be another exquisite T-Dub mix? I’m not a fan of wintry weather, but I have to say your post made me long for a snow day! Glad you’re enjoying the season. Hey! Great mix! I don’t miss shoveling snow or driving in it, but days like the one(s) you’ve had are perfect. Will there be another exquisite T-Dub mix? Oh jeez, now the pressure’s on! I’m planning on doing a mix, but mine probably won’t be ready until January.